See the video: "Inside Stumpy Jail"
It has survived 2 World Wars and is still standing as a tribute to the craftsmanship of its Victorian Builders and racing on to its 200th Birthday and is still at the centre and heart of Girvan's Community. 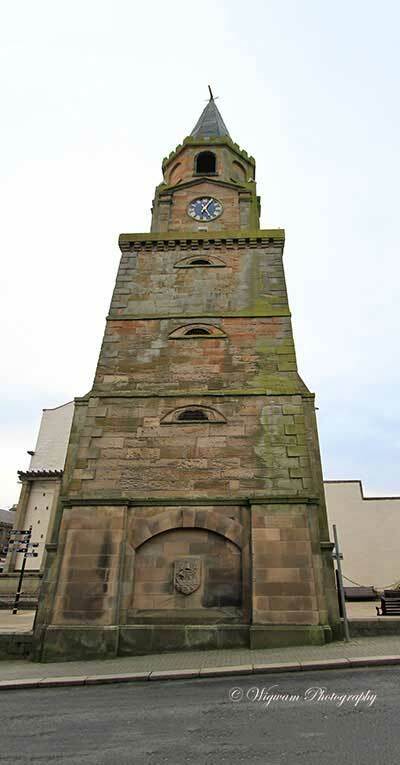 In recent years the committee of Girvan Attractions have been able to raise funds and rejuvenate the inside of the Tower with information boards on the history of Girvan and surrounding areas, making it more interactive with paintings by local artists and the use of manikins to bring the "history" to life. There are now 4 floors of exhibits for the public to view free of charge, unfortunately there are no lifts within stumpy jail and the original stone stairs are steep and old but for those people who are unable to use the stairs there is a display on the ground floor and a tourist information section that you may well be interested in which will act as a "signpost" to other attractions within the local area. Special visits for groups of tourists, community groups, and schools for educational tours can be made by special arrangement and at no cost. The attractions committee do not make any charge for the opening and operating of the jail but accept donations which are also used to run the yearly events that we also organise. The Girvan attractions committee are always on the lookout for more volunteers of "all ages" who would be willing to help us keep the historic jail open as an attraction, so if you have any time to spare and like meeting people and promoting Girvan or have any "Ideas" for the continuing development of the jail please do not hesitate to contact us. The committee would like to thank these sponsors for assisting with funding the Stumpy Jail.